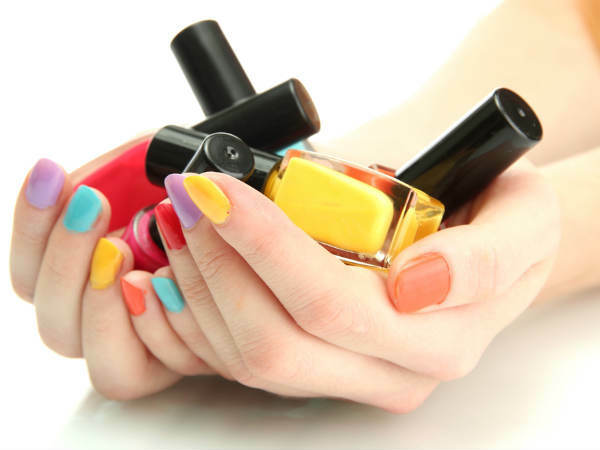 Writing so much about the beauty tips and makeover these days, it’ll perhaps be an incomplete style update if we miss the manicure part. Hands in girls look, and nail on a girls hand is something that is seen whenever talks while moving her hands; while picking up stuff and while holding her clutches and so. 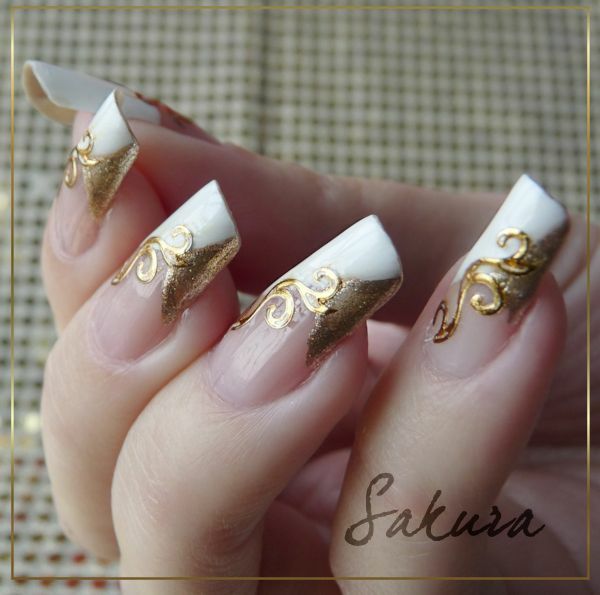 A vital difference in the look with Rough and plain nails compared with well-enhanced ones by nail paints or arts can be witnessed. In two things advancement never stops; one is technology, and other are the trends and as the trends keep on changing day by day from region to region, a big variation in all the makeovers are now in the famous cover pages. 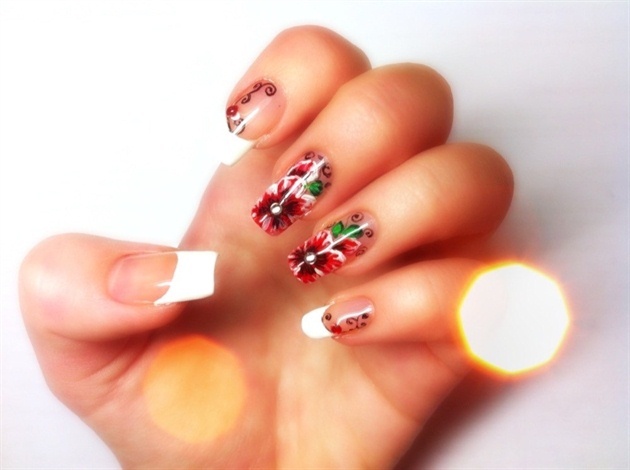 So are the nail art trends, advancing, and getting more and more variations every time in every region. 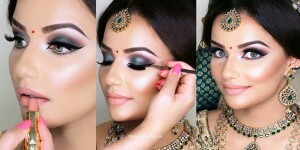 our blog has shared too many tutorials relating beauty tips including facial masks, makeups, hair masks, DIY and many more. 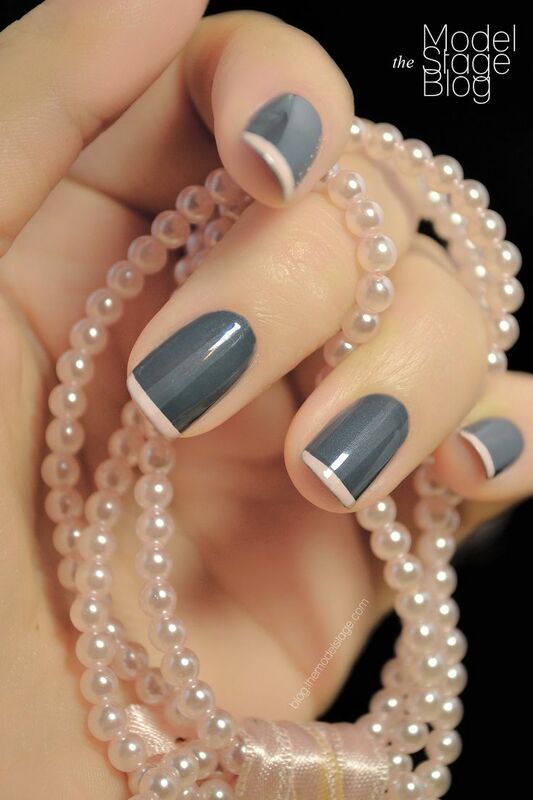 Now its the time for How to do a French Nail Art Tutorial at Home. In the recent times, different styles and designs of decorating them are associated with the areas where these designs were discovered or from which culture they are inspired. 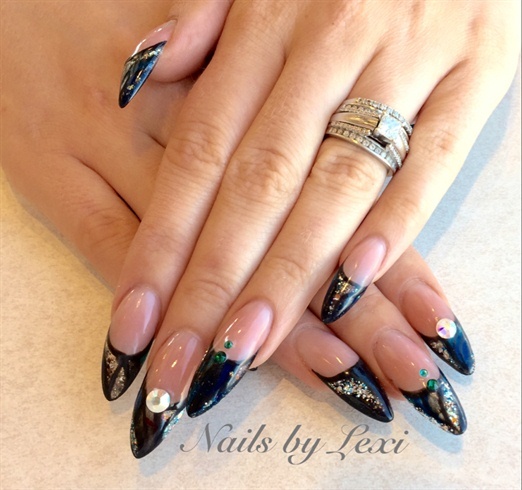 One of such inspirational theme of nail art is the subject of today “THE FRENCH NAILS ART”. Various amazing designs are included in this theme idea. So for now, we are going to take one and explore the steps of doing it! 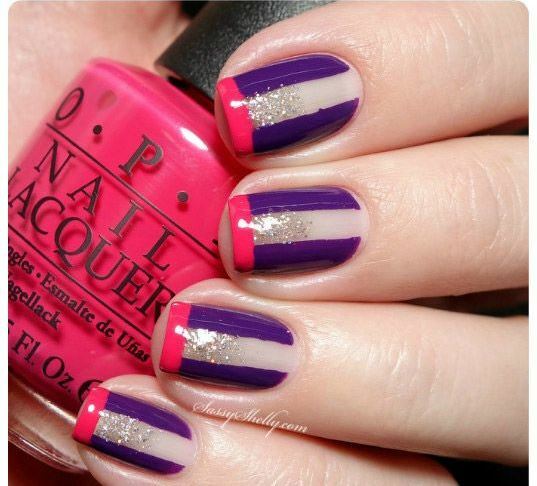 Let’s pick a simple, easy yet beautiful stripy, glittery and colorful art! 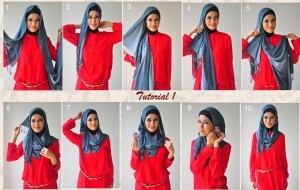 So the first thing must be the choice of colors you’ll use/need. 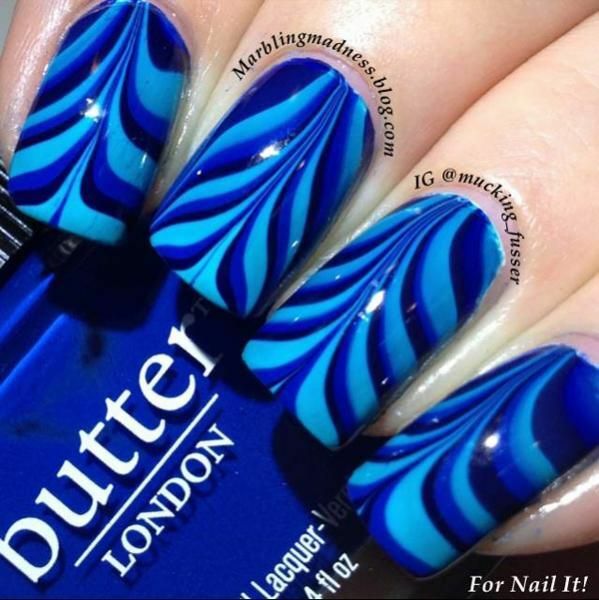 For this design; select the two colors of your choice, one glittery nail polish, and one nail’s shiner or transparent paint. 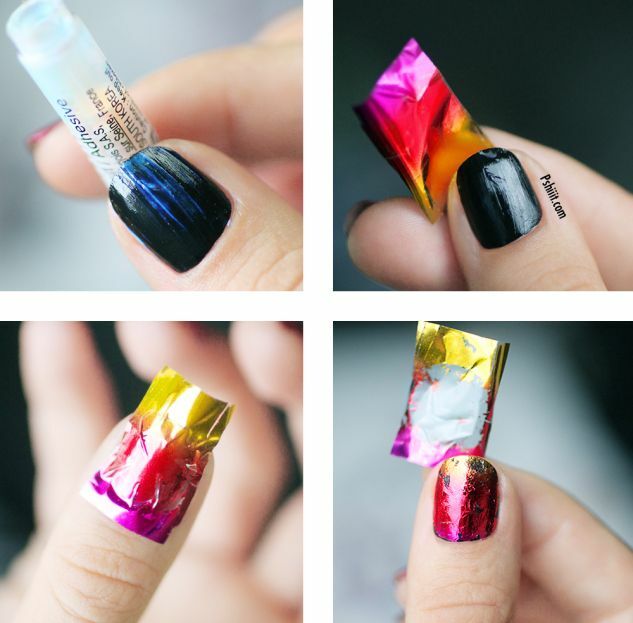 For the sake of neatness and for avoiding a mess on your finger, apply a little amount of Vaseline on the finger around the nail or cover that area by wide sticking tapes so that you don’t have to clean it. Removing the tapes or gently cleaning the Vaseline would make you at ease. 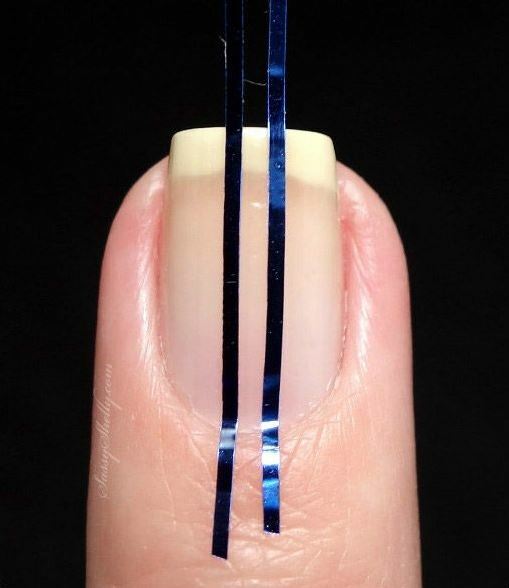 Now, grab some sticking thin stripes o cut thin strips of sticking tape and place them vertically on the nail as shown in the picture and press a bit so that they get stuck. Remember! 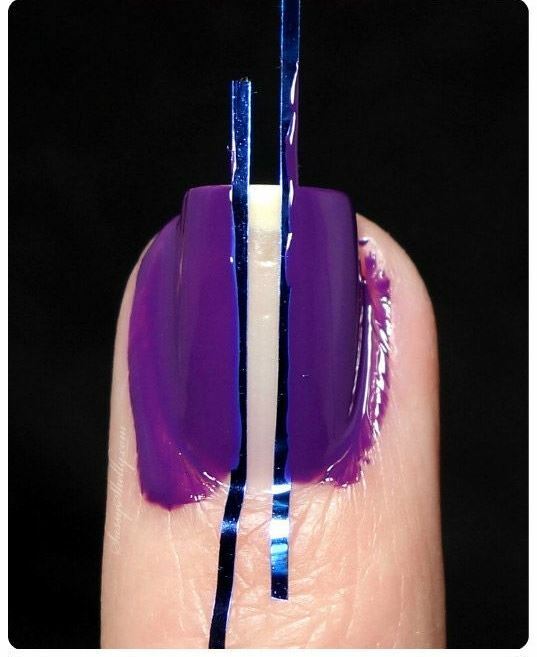 The tapes are placed onto the area of your nail which must not have the nail’s paint over it. Then take your first major color that you’ve decided, and apply it to the left of one strip and right of other while leaving the center of the stripes unpainted. Wait for this applied coat to be dried up. Dry now? 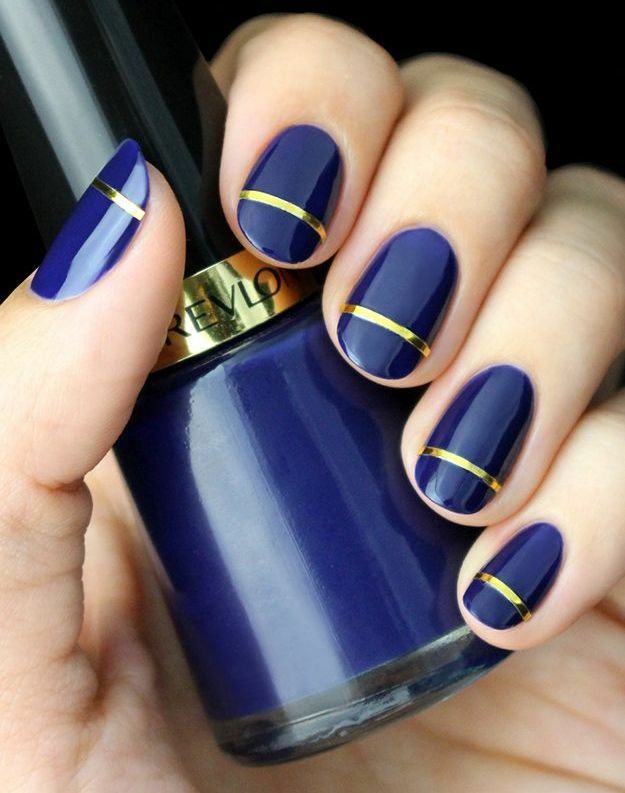 Time to take the strips off your nail! 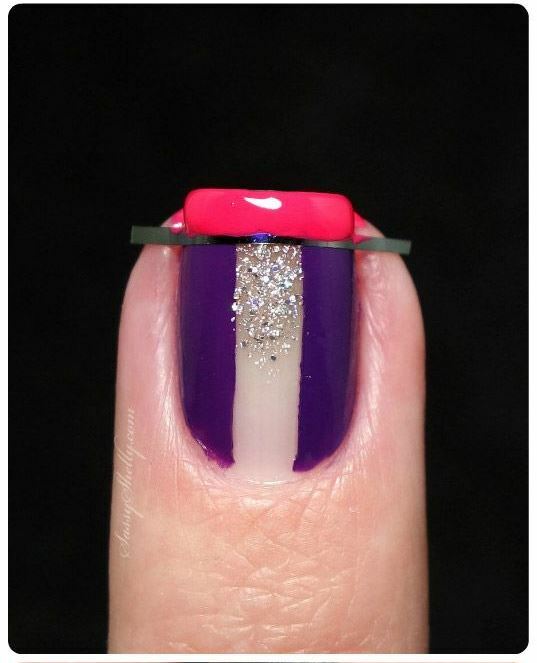 Gently remove them and in the central area between two portions of primary color (purple here) applied, add the glittery polish neatly so that it doesn’t overlap the other color. Don’t be so hastened! Let the glitter settle down. 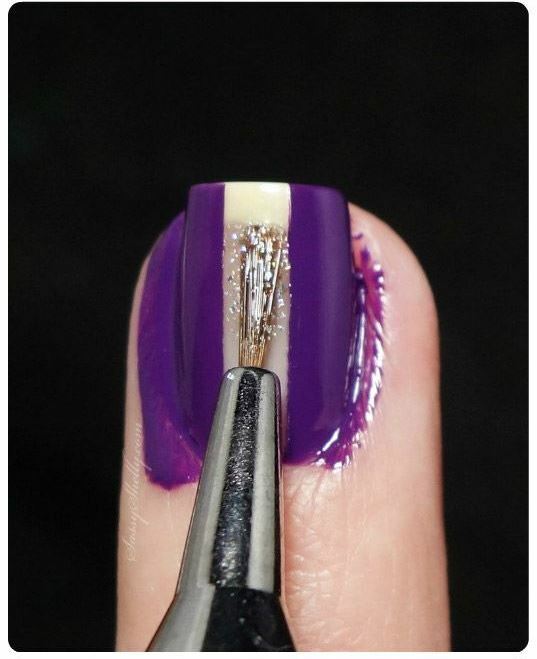 And then place a strip at the starting point of grown nail to apply the 2nd Apply the 2nd color on the white grown area of a nail as shown in the image below. 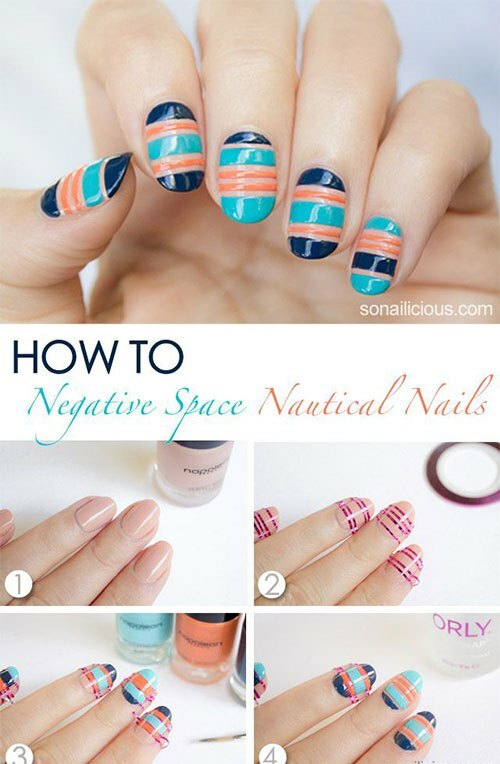 Let it dry before you take off the sticking tape strip. 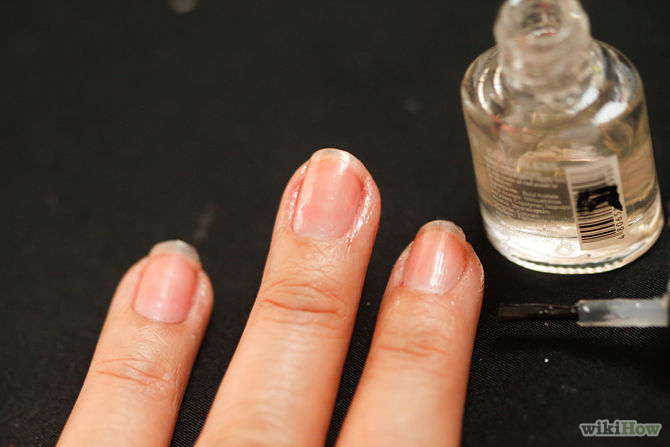 And finally, apply a coat the transparent polish top make it look even, plain and glossy. 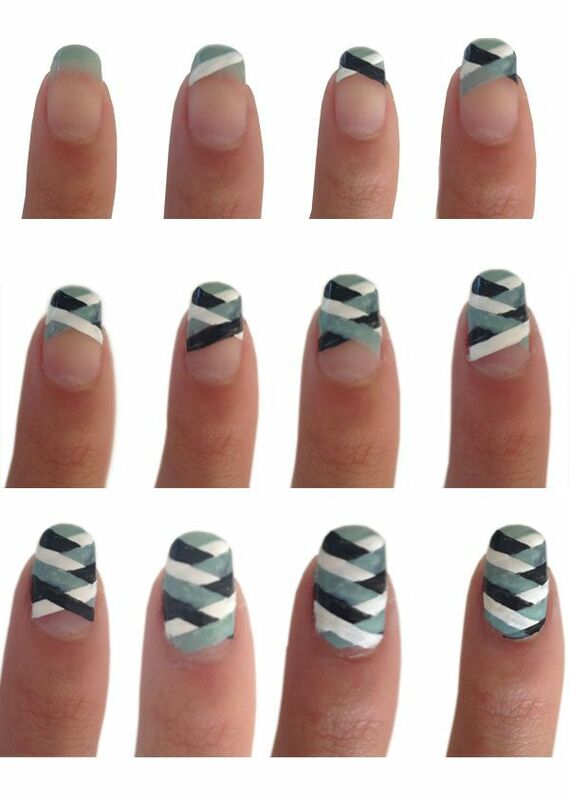 Let it dry, and your adorable French Nail Art Tutorial at Home is done, enjoy the final look of the design! Your final look is now ready to rock! 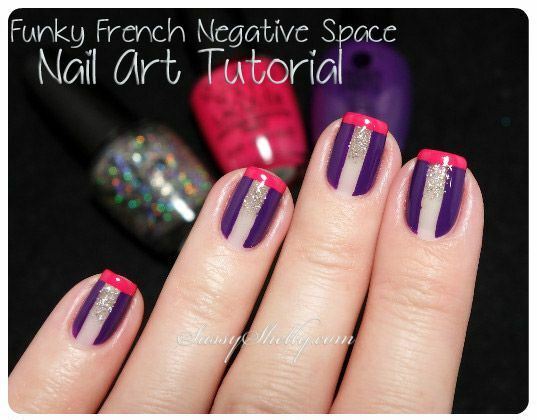 French Arts Tutorials, ideas, and combinations are right here, find a huge array of these in the images below!